A dryer is not just a dryer, especially when it comes to Belanger's AirCannon™ dryers. AirCannon vehicle dryers are engineered with the latest in energy efficient technology. They are constructed with the highest quality materials and safety features. As a result of this, our touch free dryers save wash owners money and last approximately 30% longer then others available in the market today. Choose from 3 nozzle/30 HP, 5 nozzle/50 HP, or 7 nozzle/70 HP size configurations or add on to your existing system. Engineered with energy-efficient impellers, Belanger's dryers maximize air velocity performance while using less energy. For operator convenience, these dryers are available in floor mounted and wall mounted designs allowing them to be easily incorporated into both in-bay or tunnel configuration. 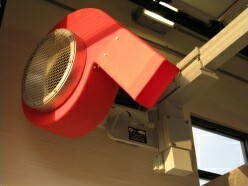 Belanger's AirCannon dryers enable operators to quickly and safely perform routine maintenance and nozzle adjustments. Unlike other products available on the market, periodic maintenance of our dryers don't require handling heavy motors. We've designed our nozzles and housings to slip on and off easily; leaving the motor in place on the frame. 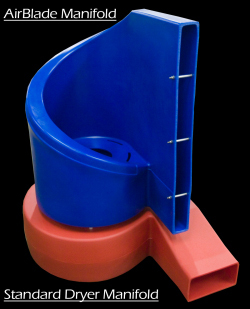 Operators will benefit from the AirCannon design because the housing can be easily moved. Quick nozzle adjustments can be made for maximum vehicle coverage without needing to adjust the motor. With so many innovative design features it’s no wonder why Belanger’s AirCannon dryers are the preferred finishing touch in vehicle washes the world over. 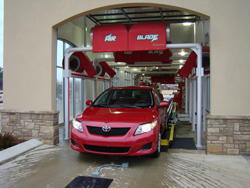 For your customers, a drier car is a cleaner car. When your dryers leave water on hoods and windshields, customers notice - because the water's right in front of their faces. That's why Belanger developed the AirBlade® dryer, designed just for drying horizontal surfaces. AirBlade® uses twin 10-HP producers to push air through a long, narrow 2-1/2 inch by 35 inch outlet (patent pending). This creates a "wall of air" that literally strips water off of hoods, windshields and roofs. 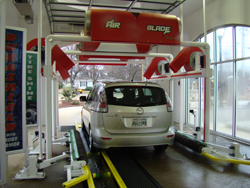 As part of Belanger's complete vehicle drying system, AirBlade® can help deliver a thorough dry. 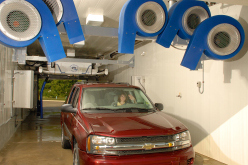 While the AirBlade® strips water off hoods, windshields and roofs, the AirCannon™ dryers deliver powerful columns of air that dry vehicle sides, and blast water out of vehicle nooks and crannies. Revolutionary AirBlade® design Delivers the most advanced drying technology available while significantly reducing equipment and utility expenses. Long 2 1/2" x 35" outlet Creates a wall of air that strips water off of the vehicle's surface. Innovative dryer housing Increase the velocity and volume of air dispensed from the nozzle for maximum removal of water in the most effective and energy efficient method available. Patent-pending air manifold Strategically channels the direction of airflow in order to reduce the competing currents of air during the drying process. Set-them and forget-them nozzles Deliver superior drying coverage on all vehicle shapes and eliminates the need for routine adjustments. 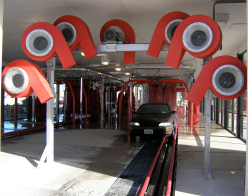 White powder-coated frame Provides a more attractive wash bay appearance and is easier to keep clean. Available in black, blue, red, green, orange, & yellow housing colors Match your branding requirements. 20HP, 40HP, 60HP, & 100HP design configurations available To meet your individual drying needs.